Kinshofer’s DemaPower cylinder technology gives the DXS-50 the same power as shears two sizes larger, resulting in the best power-to-weight ratio in its size class. The cylinder uses four chambers instead of the two found in other shears, resulting in 20 percent more surface area within the cylinder. Kinshofer, a leading source of excavator and loader crane attachments, introduced the DXS Series of hydraulic mobile excavator shears. The line features industry-leading in its size class power-to-weight ratios, jaw opening sizes, cycle times and hydraulic efficiency, according to the manufacturer. 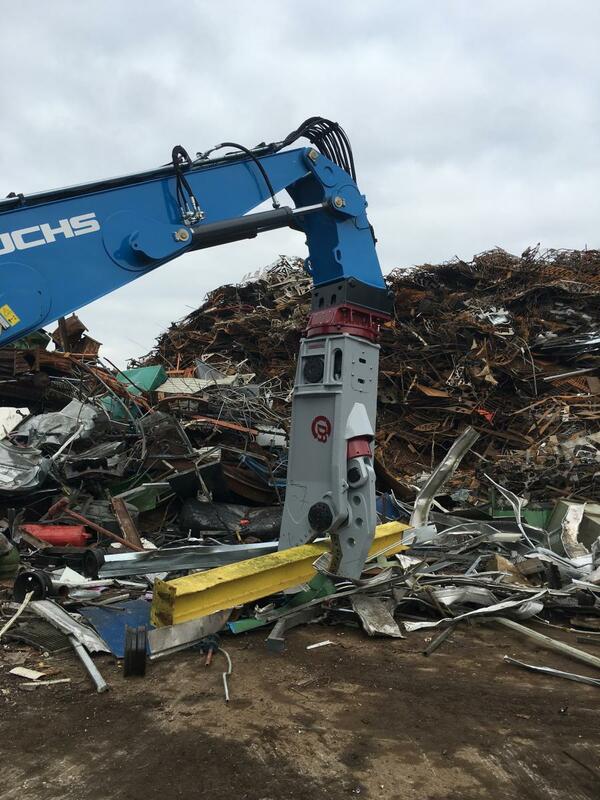 The attachment series, which debuts with the DXS-50 model, is ideal for scrap processing, tire recycling and demolition. Kinshofer's DemaPower cylinder technology gives the DXS-50 the same power as shears two sizes larger. The cylinder uses four chambers instead of the two found in other shears, resulting in 20 percent more surface area within the cylinder. That allows the DXS Series to exert up to 25 percent more power from a smaller attachment, resulting in the best power-to-weight ratio in its size class. The 9,920-lb. (4,500-kg) DXS-50 features a closing force of 1,203 tons (10,700 kilonewtons), compared to 922 tons (8,210 kilonewtons) from its 9,020-lb. (4,100-kg) predecessor, the DRS-45. Like the DRS-45, the DXS-50 is suited for 25- to 35-ton carriers when boom mounted, and 32- to 50-ton carriers when stick mounted. This means contractors can achieve a closing force equivalent to shears two sizes up, requiring a minimum 32-ton carrier, on an excavator weighing 7 tons less, according to the manufacturer. In addition, the cylinder technology allowed Kinshofer to design the DXS-50 with a jaw opening 29.2 in. (74 cm) wide and 30.7 in. (78 cm) deep — larger than any other shear in its weight class, as well as some larger models. The DXS-50 reduces carrier fuel consumption by up to 20 percent compared to competitive shear models. The attachment's efficient design allows it to function normally when the carrier is set in economy mode, achieving the same performance as a competitive shear on an excavator running at full throttle, according to the manufacturer. The DXS-50's high power-to-weight ratio makes the attachment ideal for top-down demolition, both because contractors can use smaller carriers and because the attachment's light weight and superior cylinder technology improve fuel efficiency while the excavator arm is fully extended. In addition, Kinshofer designed the attachment with a narrow frame to allow operators to better see their work. Kinshofer's double-acting speed valves and innovative cylinder technology also give the DXS-50 superior jaw closing and opening speeds. The cycle time is as fast as 5.5 seconds, 50 percent faster than any model in the attachment's weight class. Competitive models use a single-acting speed valve that allows only for a fast opening speed or closing speed, not both. The DXS-50's fast cycle times, coupled with its high power and low fuel consumption, allow contractors to complete jobs faster at a lower cost, improving ROI, according to the manufacturer. Rotation-equipped models feature 360-degree continuous rotation on an oversized slewing ring to bear high forces, shock loads and bending. The rotation model also includes heavy-duty motors for maximum rotation torque. Kinshofer designs the attachment to minimize downtime, with no protruding components that could become damaged. Convenient service openings give contractors fast access to shear hoses and hydraulics. The DXS-50 also features a piercing tip that can be welded again and replaced.